The American soldier, diplomat, and politician John Armstrong was born at Carlisle, Pennsylvania, on the 25th of November 1758. His father, also named John Armstrong (1725-1795), a native of the north of Ireland, who had emigrated to the Pennsylvania frontier between 1745 and 1748, served successively as a brigadier-general in the Continental Army (1776-7), as brigadier-general and then major-general of the Pennsylvania militia (1777-83), during the War of Independce, and was a member of the Continental Congress in 1779-80 and again in 1787-88. 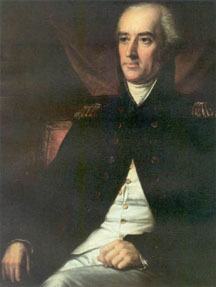 The son studied for a time at the College of New Jersey (now Princeton University), and served as a major in the War of Independence. In March 1783, while the Continental Army was stationed at Newburgh, New York, he wrote and issued, anonymously, the famous "Newburgh Adresses." In 1784 he led a force of Pennsylvania militia against the Connecticut settlers in Wyoming Valley, and treated them in such a high-handed manner as to incur the disapproval even of the Pennsylvania legislature. In 1789 he married the daughter of Chancellor Robert R. Livingston of New York, and removed to New York city, where his own ability and his family connection gave him great political influence. In 1801-2 and again in 1803-4 he was a member of the United States Senate. From 1804 to 1810 he was the United States Ambassador to France, and in March 1806 he was joined with James Bowdoin as a special minister to treat through France with Spain concerning the acquisition of Florida, Spanish spoliations of American commerce, and the "Louisiana" boundary. During the War of 1812, he was a brigadier-general in the United States Army from July 1812 until January 1813, and from then until August 1814 Secretary of War in the cabinet of President James Madison, when his unpopularity forced him to resign. "In spite of Armstrong's services, abilities, and experience", says Henry Adams, "something in his character always created distrust. He had every vantage of education, social and political connection, ability and self-confidence... but he suffered from the reputation of indolence and intrigue." Nevertheless, he "introduced into the army an energy wholly new", an energy the results of which were apparent "for half a century." After his resignation he lived in retirement at Red Hook, New York, where he died on the 1st of April 1843. He published Notices of the War of 1812 (2 vols., 1836; new ed., 1840), the value of which is greatly impaired by its obvious partiality.